We’re always eager to give the latest Indie title a try here at BrainLazy, and there are plenty of reasons to do it. Not only do Indie games tend to have a lot more heart and soul than their big budget counterparts, but they also tend to look back to an earlier era for inspiration. They revisit game types that have been neglected in recent years. Such is the case with Puzzle Bots, an Indie adventure game from Wadjet Eye Games, now available on Steam. 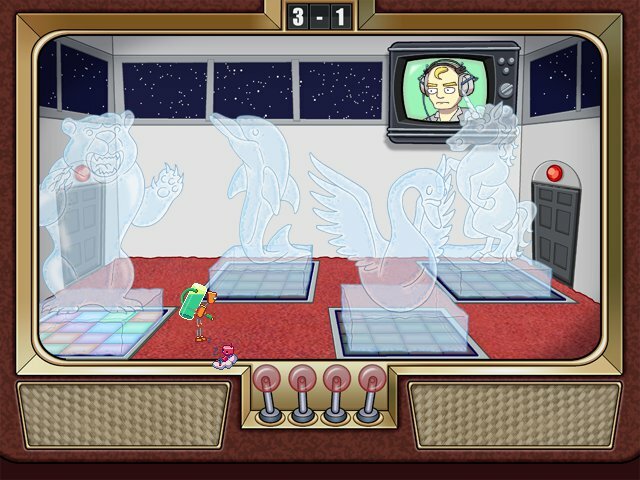 Puzzle Bots has a cartoony/pixelated art style, and it works pretty well. Since the titular robots are of the itty bitty variety, most of the game is played at a very small scale. 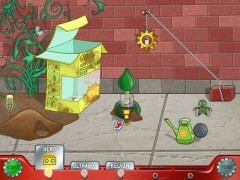 This treats you to scenery in which toys seem life sized, and frogs and birds are titanic obstacles. The cut scenes, on the other hand, frequently deal with the inventors. This shifts the scale back to one we are more familiar with. It is a small detail, but I sort of enjoy seeing the counter top that my robo-compatriots heroically traversed shown from afar. To the robots, it was puzzle after puzzle of trying to bridge gaps and clear obstacles. To the people, it is an unremarkable workspace. That, along with the character design for the inventors, gives the game sort of a “Rugrats” feel. Rounding things out, while no attempt is made to make interactive objects stand out, little attempt is made to hide them, either. A crack here to identify a bombable object or a glimpse of color there to indicate a hidden collectable make sure that there is very little in the way of the pixel hunting that can plague games of this sort. 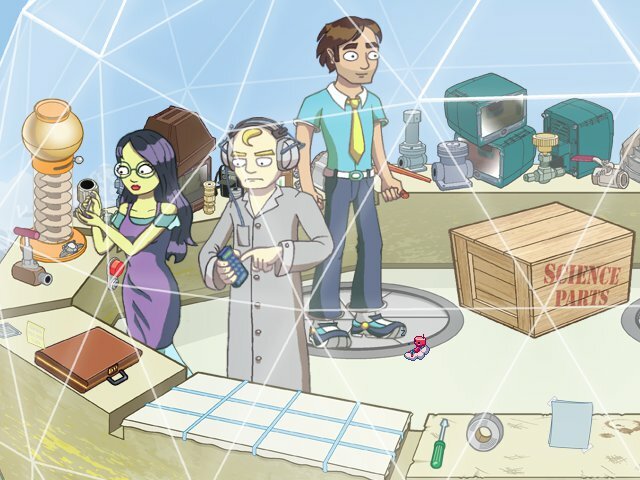 Despite the title, Puzzle Bots is more of an adventure game than a puzzle game. Judging from a joke made during the end credits, the makers felt this way as well but didn’t want to scare away non-adventure fans. 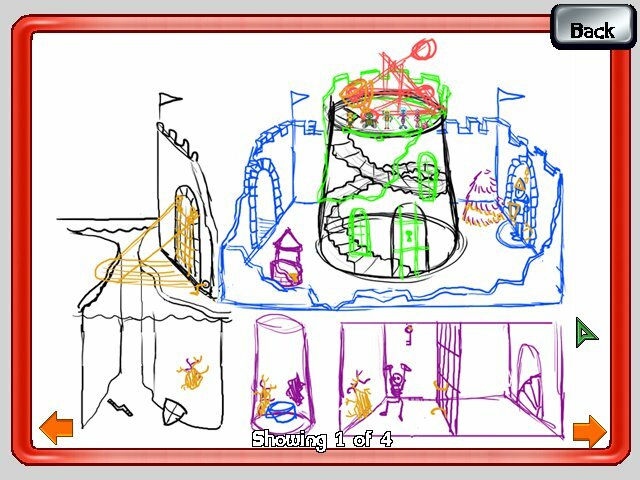 The game, when you get right down to it, is about finding what objects and areas are interactive, and finding out where and when to uses items and switches, the usual adventure game stuff. That said, it isn’t just another vanilla adventure game. Puzzle Bots has a bit more to offer in terms of variety. There are, eventually, five robots, each with their own abilities that help you solve the tasks at hand. 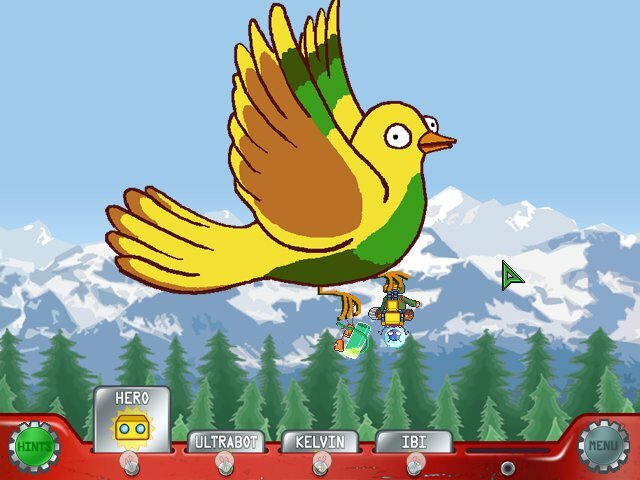 First is Hero, a little yellow robot who can transport items from here to there. Next is Ultrabot, who can push and pull items. Then comes Kelvin, a little robot equipped with a flame thrower. After that is Ibi, the token swimmer, who is essentially an aquatic version of Hero. The last is Bombchelle, who as her name suggests can toss bombs. Each robot gets its own, solo level of tutorials to give you an overview of their abilities and to highlight the differences in their gameplay. Hero has to cope with the fact that he can transport only one item at a time, for instance, so there is a little bit of inventory juggling to be done. Kelvin, on the other hand, has to deal with the fact that many of the things that he heats up eventually cool down, so he’s got timing issues to cope with. 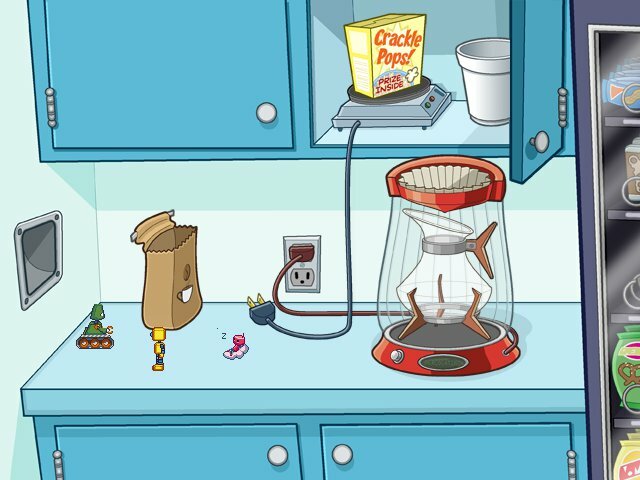 Individually, the different techniques available to each robot gives them a slightly different puzzle solving style. When combined, things become more complex. 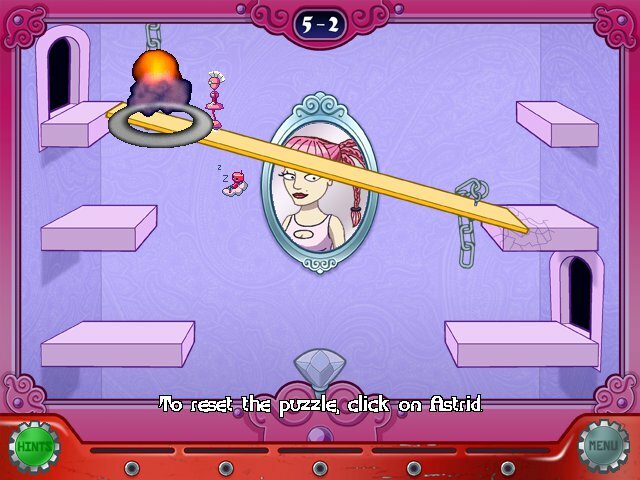 The puzzles never become fiendishly difficult, but very few of them are flat out obvious in their solution. They are well constructed, for the most part, leading you slowly but surely along the steps necessary to reach the solution. There is a hint system in place, but I never had to use it, and only once did I render a puzzle unsolvable and need to reset it. This happened during a tutorial. From the looks of it, the robots themselves will not allow you to perform any action that will make it impossible to beat an actual gameplay level. The low difficulty, impossibility of death, and good puzzle structure make the game fly by. I managed to finish it, and find all of the bonus items, in just a few hours. Said bonus items unlock bundles of concept art, and finding them all nets you some voice work bloopers. Unfortunately, by the very nature of the game there is little in the way of replay value. Regardless, while on the whole I would say that the game as a slice too easy for an adult, the presentation and difficulty would make it an excellent fit for youngsters with a decent attention span. The only part of the audio in this game that really stands out to me is the voice work. A game of this sort typically makes due with subtitles and captions. With the exception of most of the robots most of the time, though, this game gives all of its characters a voice. Now, are they GOOD voices? Actually, yes. Each character has got a voice to fit his or her attitude and appearance, and the lines are delivered with emotion and life. The light plot and varied characters are really fleshed out by their voices in a way that mere subtitles could never really achieve. The story is another thing that cements this as an adventure game rather than a puzzle game, in that it HAS a story. A quartet of quirky inventors work for a shifty misfit of a boss, each creating robots. I don’t want to give too much away, but the characters are likable, from the absent minded Zander to the insecure yet capable Yuriko and the borderline sociopath Victor. The robots have the standard “cartoon adventurers” set of character traits, too. Hero is the Tommy Pickles of the group, and Ultrabot is the Chuckie Finster. There’s a fair amount of humor, and it is above average as well. 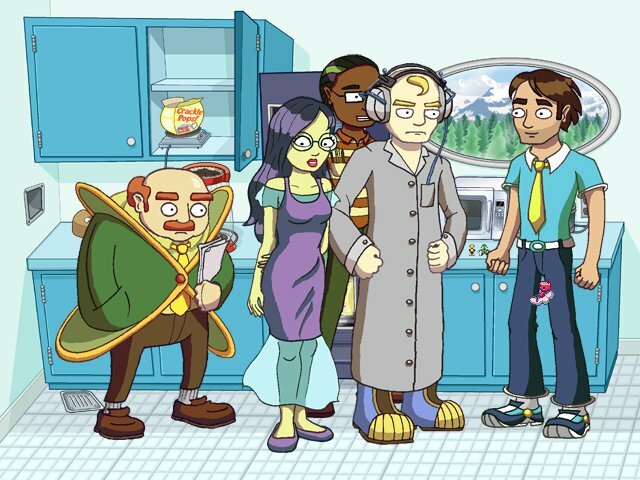 There is a sequence where Zander repeatedly wanders in to the break room and discovers pre-made food (the result of the robots’ puzzle solving) that I found particularly entertaining. The plot involves discovering the reasoning behind the boss’s bizarre behavior every time a toy is found. There are also some romantic aspects, focusing on the love-story staple of “the new girl and the oblivious guy.” Nothing ground breaking, but plenty to keep you interested, and more than you’d normally expect from a game with puzzle in the title. As a sum of its parts, Puzzle Bots is a pretty good game. 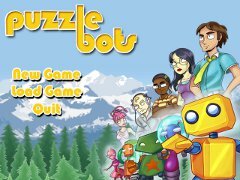 If you are interested in a light reminder of the glory days of adventure games, or if you’ve got kids you’d like to ease in to the Puzzle/Adventure Genre, Puzzle Bots is a good fit. 8.0 / 10. 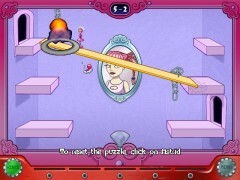 Puzzle Robots is a well crafted Puzzle/Adventure game. Great for kids.